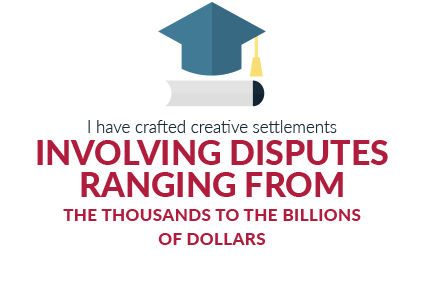 As a lawyer, I have represented clients in major arbitrations, mediated scores of cases, and negotiated and crafted creative settlements involving disputes ranging from the thousands to the billions of dollars. I’ve resolved cases involving from two parties to dozens, mass actions involving tens of thousands of claimants and class actions hundreds of thousands. 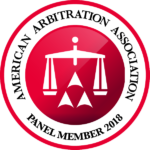 As a neutral, I will be joining the roster of the American Arbitration Association. I am also a hearing examiner for the DC Board of Professional Responsibility, a Fellow of the Chartered Institute of Arbitrators, an incoming member of the DC Court of Appeals Mediation panel, the Co-Chair of ABA Judicial Division Lawyers Conference Special Masters Committee, the convener of the Working Group of members of the National Conference of Federal Trial Judges, National Conference of State Trial Judges, Lawyers Conference, Litigation Section, Business Law Section, Dispute Resolution, Antitrust Section, Torts Trials and Insurance Practice Section and Intellectual Property Law Section to draft the ABA’s first official pronouncement (“black letter”) on the use of special masters and received the 2017 Civil Justice Award from the Academy of Court-Appointed Masters.